In a pan, heat the oil. Once hot, add garlic and chilies and sauté for a few seconds. Add in the red curry paste and mix well. Add the coconut milk and mix again. Then add in the sugar, soy sauce or fish sauce. If you are making a non-vegetarian dish, then add the chicken now, cover and allow chicken to cook partially. Let it cook for a minutes and then add tofu. Add the basil leaves and cook for another 3-5 minutes. And then add broccoli. Cook till chicken / tofu is cooked. Garnish with a few more Thai Basil Leaves and serve hot with some steamed rice. 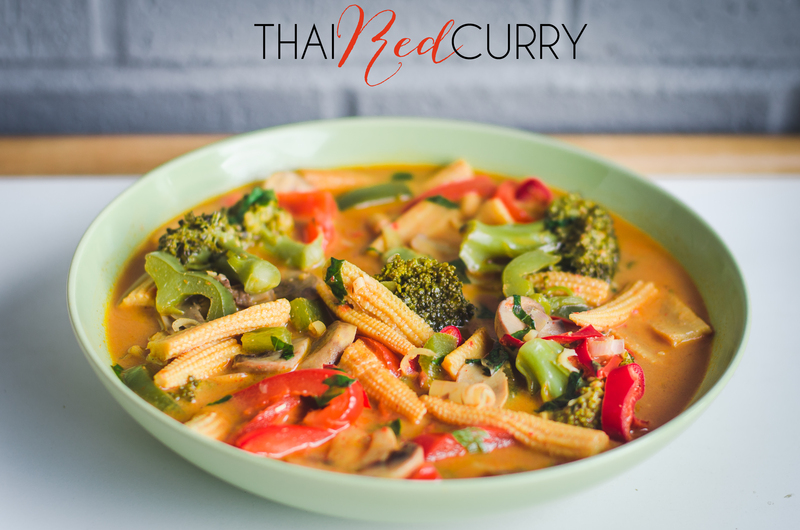 This entry was posted in FOOD, Recipes and tagged basil, chicken, curry, healthy, quick and easy, red curry, red curry paste, thai, thai cuisine, thai red curry, tofu. Bookmark the permalink.